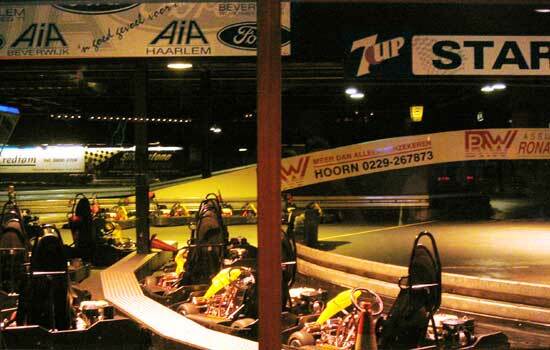 Location: Silverstone Silverstone Indoorkarting and Lasergames, Weerenweg 21-23, Zwanenburg, Nr Amsterdam, The Netherlands. 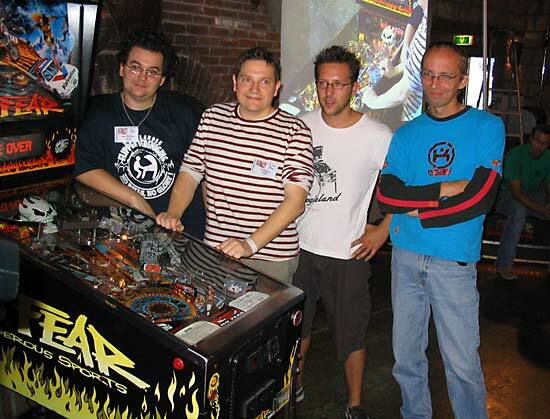 We were last at Silverstone in May 2005 for the European Pinball Championships. 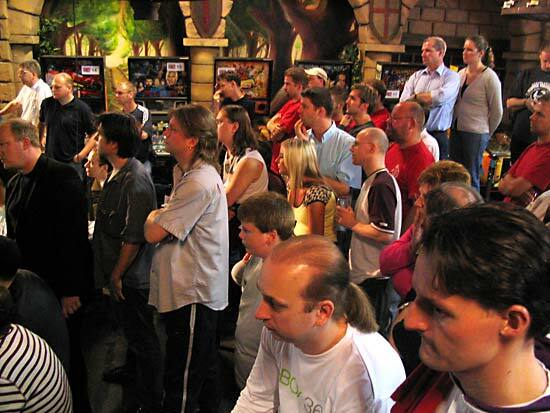 With this year's EPC held in Munich, the Dutch Pinball Association were holding their Dutch Pinball Open at the venue. The building itself is set in an industrial park in Zwanenburg, which is to the west of Amsterdam. Although there was a bus service to the town from Amsterdam Slotterdijk station, driving is by far the easiest way to reach it. Much of the space inside is taken up by the karting track which is thankfully behind large glass soundproof windows. The rest of the building is divided into several different areas. Registration took place near the entrance next to the bar and was relatively quick although some of the pre-paid packages were missing items such as raffle tickets. 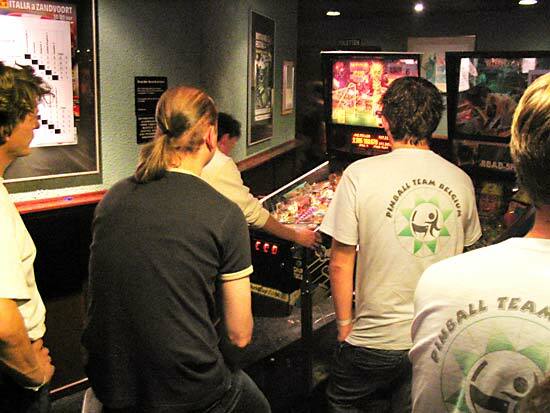 Entry to the event cost €10 for members of the Dutch Pinball Association(NFV) as well as allied organisations and €15 for non-members. 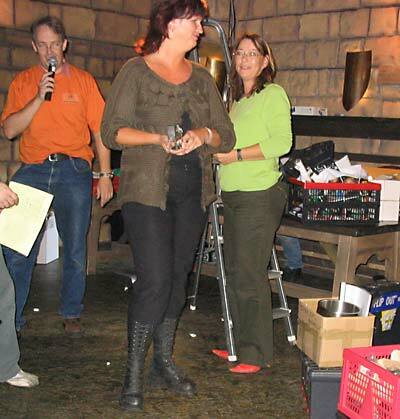 Entry to the main individual tournament was €10 for members and €12.50 for members. Reductions on all these prices were available if you pre-registered and paid in advance. The Team Competition cost €15 per team, the Ladies Championship €5. 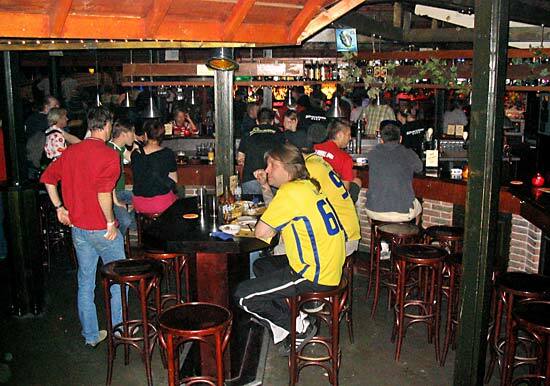 The central bar provided drinks and food all weekend. On our last visit they only accepted tokens as payment but this year cash was fine too which made things easier. 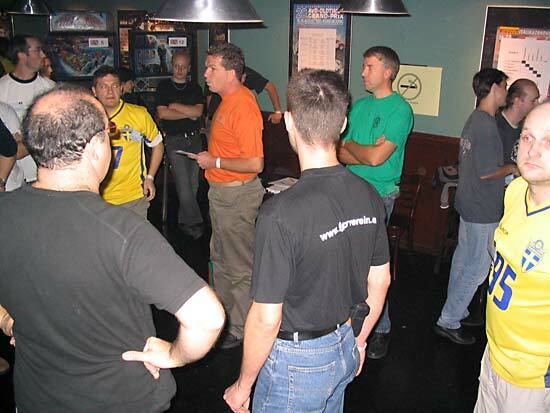 Games were set up around the bar area and were on free play for recreational players and for practice. There was also a side room just off the bar used for parts sales and another for the Team Competition. Down a short corridor was this Scorpion game and the entrance to the laser gun arena. 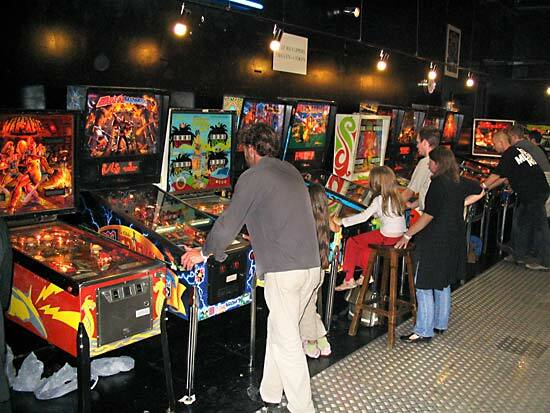 Down a further corridor and past a back-to-back Pinball Magic and NBA Fastbreak was another games area. 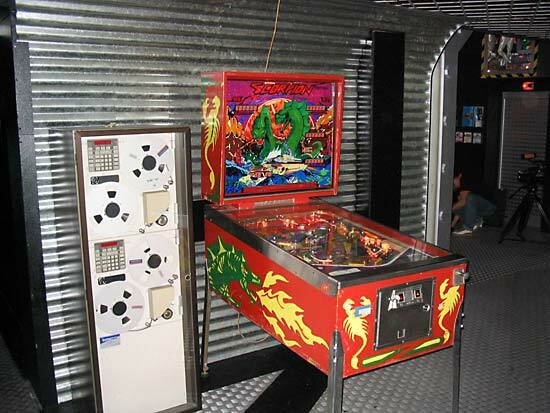 When not being used to host pinball events, this is the home to the Pinball Magic collection of games and open for the public to play. Down another passage was the most distant room which housed several dance machines but also a few interesting pinball games. Yes, those games really are mounted up on the walls, far out of reach. 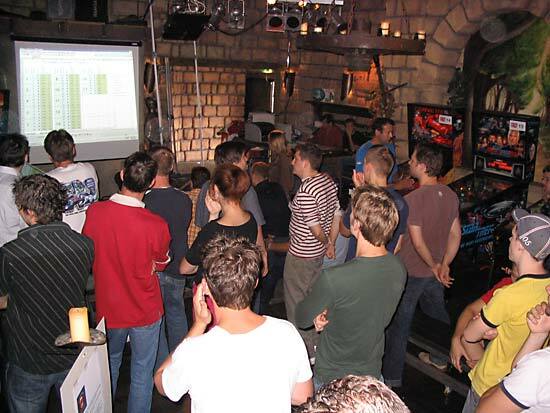 At the back of the room were three Formula 1 games from the only Dutch pinball manufacturer, JVH. Formula 1 never went into production. Only 3 prototypes were ever made, and here they are all together. And talking of games that never went into production, at the entrance to the room was another game that - until recently - was also in that category. This Big Bang Bar is one of the games recently produced by Pinball Manufacturing Inc and exported to Europe ahead of the introduction of RoHS laws. 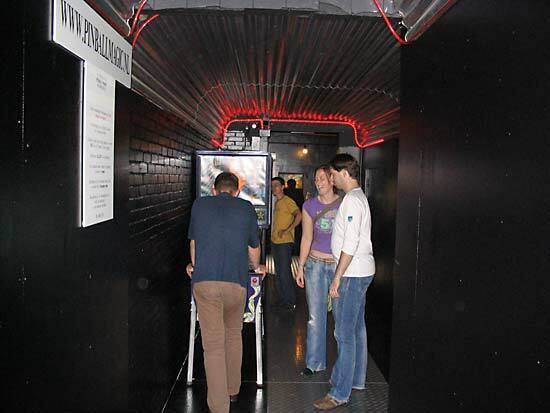 Each visitor to the DPO was given the two tokens needed for a game on Big Bang Bar, ensuring everyone got one opportunity to experience the game for themselves without anyone hogging it for long periods. The game stood up well to a weekend of prolonged play which is a testament to the build quality. 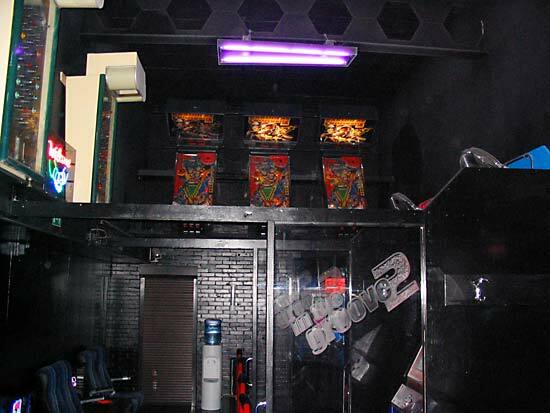 The other games area was the Castle Room just inside the building's entrance on the right. This room was used for the main DPO individual tournament qualifying rounds as well as the final and the awards ceremony. Ro Go, Big Valley, Fun Fest, Batman Forever, Magic Castle, The Lord Of The Rings, World Poker Tour, Pirates Of The Caribbean, Grand Prix (Stern), Monopoly, Funhouse, Ice Mania, Escape*, Scorpion, Pinball Magic, NBA Fastbreak, Big Bang Bar, Revenge From Mars, Viking, Medieval Madness, Smart Set, Tales Of The Arabian Nights*, No Good Gofers, Jungle*, Theatre Of Magic, Scared Stiff, Elvira & The Party Monsters, Dr Who, Nitro Ground Shaker, Jackpot, Eight Ball Champ, Four Million BC, Grand Prix (WMS)*, Big Deal*, Harlem Globetrotters, Twister, Starship Troopers, Judge Dredd, Bram Stoker's Dracula, Centaur, Indiana Jones, Target Alpha, Stargate*, Gorgar, WhoDunnit?, Safecracker, Funhouse, Freddy - A Nightmare On Elm Street*, Vector, Al's Garage Band Goes On A World Tour. On Saturday, the Team Competition started at midday with ten teams of four players from Belgium (2 teams), Germany, The Netherlands (3 teams), Sweden (2 teams), and the UK (2 teams). After the initial briefing, play began on 12 games: Road Show, Jackbot, Cirqus Voltaire, Scared Stiff, Whitewater, World Cup Soccer, Creature From The Black Lagoon, Fish Tales, Theatre Of Magic, Dirty Harry, Congo and The Addams Family. Teams were split into two pools and played 3 games against each opposing team - first a game with all four players for 5 points and then split into two pairs earning 9, 5, 2 and 0 points for 1st to 4th place. (Albert Nomden, Dirk Klaver, Paul Jongma, Mark van der Gugten) and Belgium 1 (Lieven Engelbeen, Eric Buysen, Peter Van den Bergh, David Deturck) played out on World Cup Soccer, Theatre Of Magic, Road Show and Dirty Harry. After the first two games, The Netherlands led by 20 points to 12. They went on to win the top two places on both Road Show and Dirty Harry for a 48 points to 16 points win. There were play-offs for 5th, 7th and 9th positions which were won by Sweden 2, United Kingdom 1 and United Kingdom 2 respectively. Third place was not contested. Peter Van den Bergh, David Deturck. Martijn van Amsterdam, Helen de Haan-Verbeek. 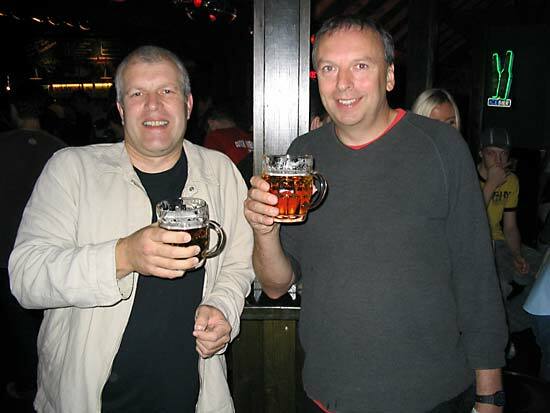 Jan Vandesompele, Pascal Van Wonterghem. Meanwhile, the main DPO individual competition had begun in the Castle Room. In the first qualifying round, each player played a game on any five of the games available. They were: Johnny Mnemonic, Junk Yard, Twilight Zone, Monster Bash, The Shadow, Cirqus Voltaire, Hurricane, Medieval Madness, Indianapolis 500, Attack From Mars, Creature From The Black Lagoon, Congo, No Fear, Corvette, Star Trek - The Next Generation, The Flintstones, Champion Pub, Indiana Jones, Road Show and The Addams Family. The player could choose which five games they wanted to play and play them when they were ready. A printed list of recent scores was provided on each game so players knew what score to beat. 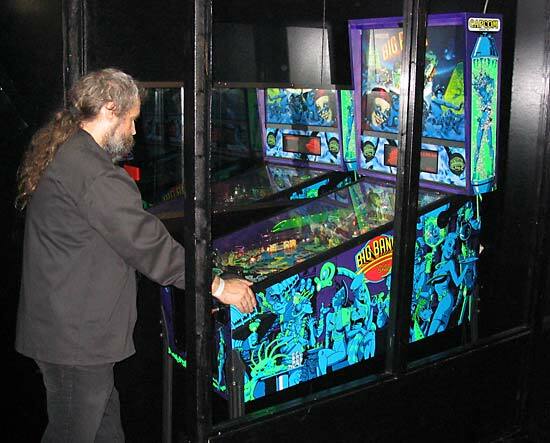 The games were all Williams/Bally dot-matrix games from the '90s so fans of those games were at a distinct advantage. When qualifying finished at 10pm, the top 15 scorers on each game received points ranging from 20 for the top score to 1 point for 15th place. The top 30 players then progressed to the next round where they were joined by the Team Competition finalists (who were busy playing during the qualifying round) and other pre-qualified players to give a total of 48 players for Sunday. When everyone had gathered at 11:30am on Sunday, the first round could begin. 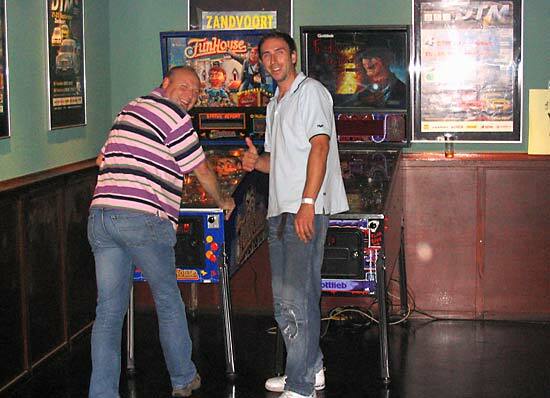 Players were divided into groups of 4 and played a single game on a random machine with the top two scorers going through to the next round. The lowest two scorers went into the bonus round which ran alongside the main round and with the same rules. If a player lost in the bonus round then they are out of the competition. So with 24 main players and 24 bonus round players, round two was a 3 player game with the top two progressing and the lowest score dropping out into the bonus round. This left 16 who played four 4-player games with the top 2 going through. The remaining 8 from the main round were then joined by the 8 surviving players from the bonus round to form the final 16. From now on, there was no bonus round and losing players were out of the competition. They then played four 4-player games with the top 3 going through, leaving 12 players for round 5. This was four 3-player games with the lowest score dropping out for 9th place. With just 8 players left, the semi-final was four head-to-head games with the winners going into the final and the losers finishing in 5th place. The final four played a single 4-player 5-ball game on No Fear to decide the winner. DPO finalists: Brenn Oosterbaan, Mats Runsten, Taco Wouters and Albert Nomden. Lots were drawn and Taco played first, followed by Albert, Brenn and Mats. The game was also projected on a large, bright video screen so the assembled crowd could see all the action. By the end of the 4th ball, Mats was leading with 5.27B, Taco was second with 4.76B, Brenn had 4.06B and Albert was fourth on 528M. The last ball saw Taco build a strong lead, boosting his score to 6.82B. Albert staged an amazing recovery from his 528M, building it up to 5.03B before the inevitable drain brought his game to a close. Brenn has another good ball to bring his score up to 5.45B while Mats could only build a little on his already great score, ending on 5.64B and second place. 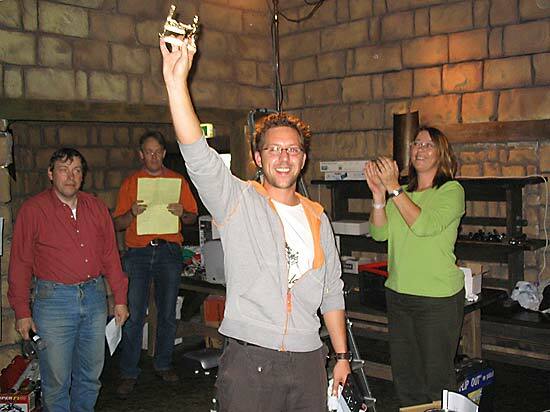 But it was Taco Wouters who took first place and the title of DPO Champion 2006. While the final rounds of the DPO were taking place, there were also a Ladies Tournament, a Kids Tournament and a Veterans Tournament. 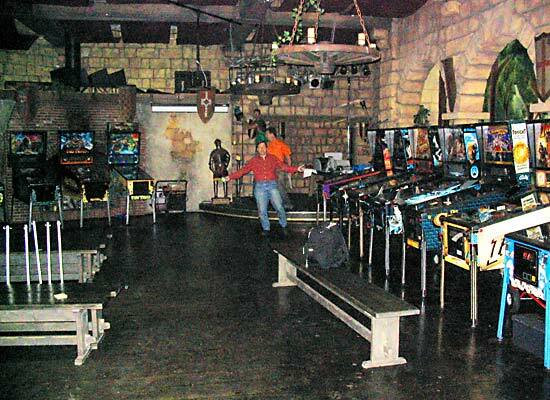 In the Veterans competition the 16 players were divided into two groups and each group played games on three machines. 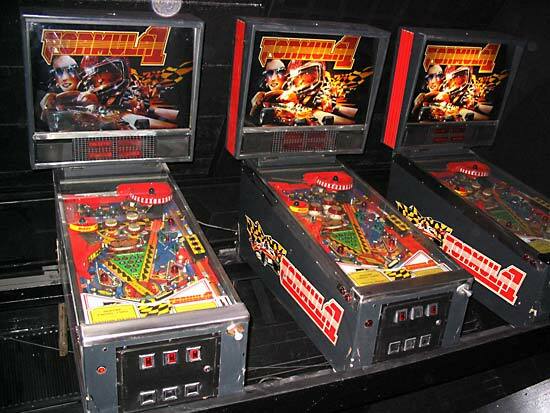 Group A played on 8 Ball Champ, Nitro Ground Shaker and Smart Set, while Group B also played on Smart Set along with Gorgar and Harlem Globetrotters. The top two from each group then played a final on Scorpion. The winner was Colin Hampton from the UK and the runner-up was Eddie Mole, also from the UK. 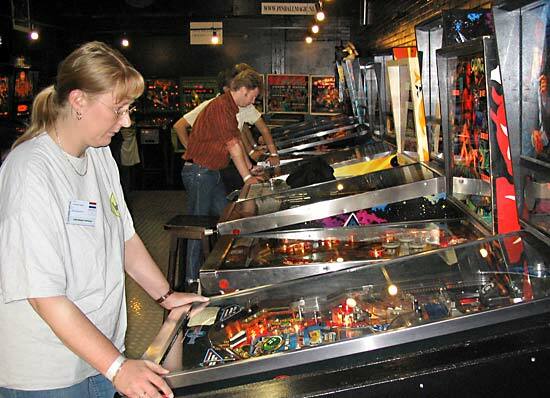 In the Ladies Tournament, players were divided into groups of four and played a 3-ball game on each of the five machines used from those in the Team Competition area. 19 players took part in total and the top eight then qualified for the semi-finals played out on World Cup Soccer and Theatre of Magic. The top two players from each game went into the final which was held on Road Show. Karin Tjalsma triumphed in the final. 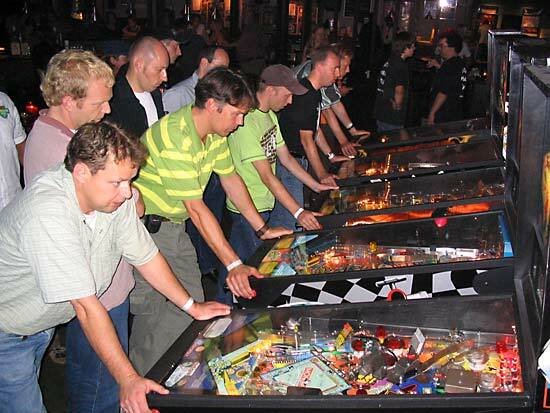 She said she hadn't played any pinball for the past year and only entered the competition for fun. 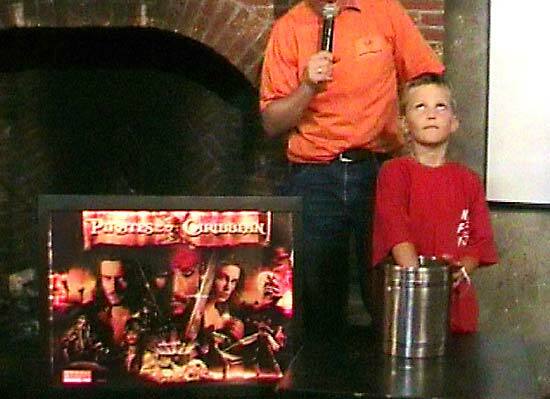 After the awards were handed out following the Individual Tournament final, there was a raffle for a number of prizes including illuminated Pirates Of The Caribbean translites culminating in the winning of a Shadow pinball machine. All of which brought another DPO to a close. There were a number of improvements to the event this year. Being able to choose the games to play in the qualifying round of the individual tournament removed the complaints about having to play unknown games. The scores achieved and the level of play in the final showed how the process produced four very good players. Clearly there were fewer recreational games compared to last year, but that was the European Championship too, so it wasn't totally unexpected. 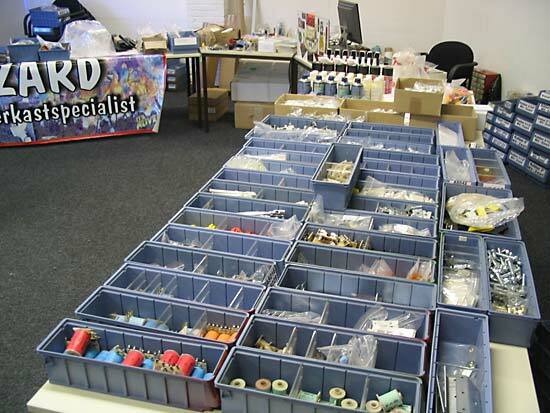 Flipperkastspecialist were there with a good selection of new parts and the DPO table had a few souvenirs and flyers but more choice and some of the more unusual spares would have been welcome. But organisationally it was a very smoothly run show with plenty of support staff to make announcements, record scores and fix problems. 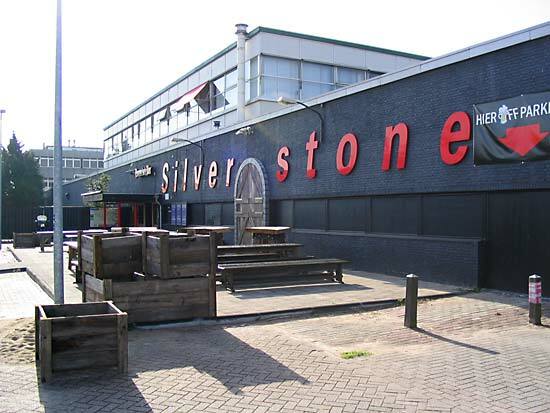 The Silverstone staff were helpful and friendly in fixing food, drinks and ordering taxis, while the venue is well suited to holding one big tournament with several smaller ones in the various side rooms. The recreational games were an interesting mix of the very newest Stern games and older and rarer models, although unfortunately too many of the latter either didn't work or had no credits on them most of the time, rendering them useless. The four newest Stern games were very popular though and were busy all weekend while the Big Bang Bar was a great addition to the show and the token play ensured it was never too long a wait to play it. So, another very good Dutch Pinball Open from the NFV. Roll on 2007. Three Minute Tour - our video walk through the show areas.